The site encompasses a group of five frontier mission complexes situated along a stretch of the San Antonio River basin in southern Texas, as well as a ranch located 37 kilometers to the south. 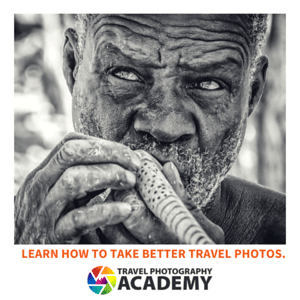 It includes architectural and archaeological structures, farmlands, residences, churches, and granaries, as well as water distribution systems. The complexes were built by Franciscan missionaries in the 18th century and illustrate the Spanish Crown’s efforts to colonize, evangelize and defend the northern frontier of New Spain. 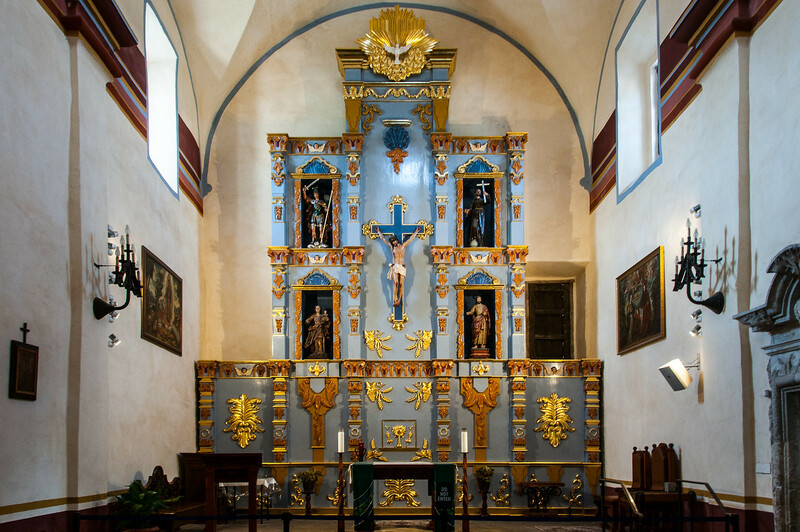 The San Antonio Missions are also an example of the interweaving of Spanish and Coahuiltecan cultures, illustrated by a variety of features, including the decorative elements of churches, which combine Catholic symbols with indigenous designs inspired by nature. 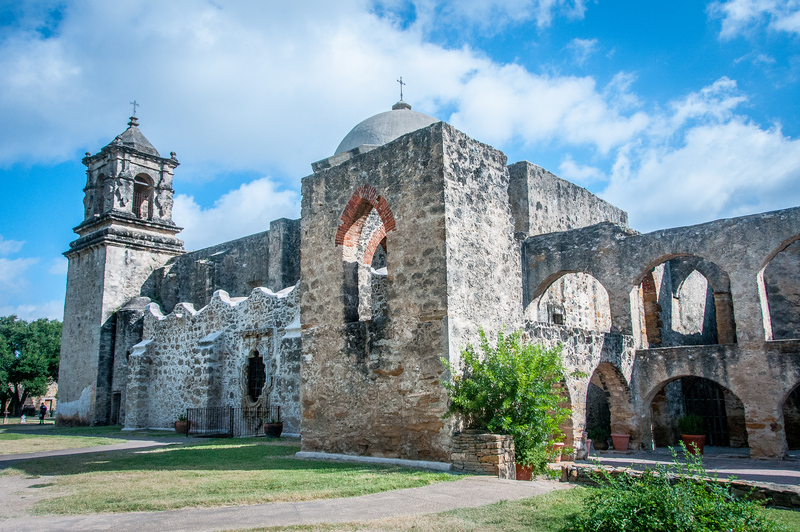 The Missions of San Antonio are United States‘s newest world heritage site. In fact, it was listed at the World Heritage Convention in Bonn, Germany just one week before I visited. The Alamo is owned and maintained by the Daughters of the Republic of Texas. The other four missions are run by the National Park Service. Most people visiting San Antonio will probably visit The Alamo, which is the most popular tourist attraction in the State of Texas. 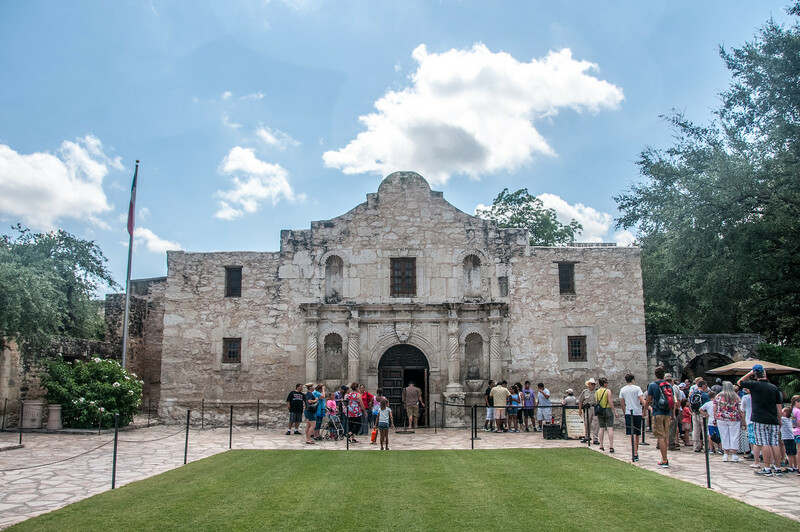 Given the historic events which occurred at The Alamo and its role in Texas independence, not to mention the fact that it is right in the middle of San Antonio, it is no surprise. On the plus side, it is also very close to the San Antonio Riverwalk. However, from a visitation perspective, I think The Alamo might be the least interesting of the five missions. It is by far the smallest and is surrounded by touristy things like a Ripley’s Believe It Or Not museum. I’m not saying you shouldn’t visit The Alamo (you should), so much as you should visit the other missions as well. All the missions are relatively close, lying only 2-3 miles apart from each other. If you have a car it is quite easy to drive between the missions with less than a 10-minute drive between them. The other missions are much larger than The Alamo and give you a better feel for how they were laid out. The rest still have their walls and courtyard intact. It should also be noted that the missions, which were built as Catholic churches by the Spanish Empire, are still functional churches today. They still have services on Sundays and events like weddings do occasionally take place. Unless you wish to attend a service, you might want to avoid visiting on Sunday mornings. Along with Independence Hall in Philadelphia and the Statue of Liberty, the missions are the only urban world heritage sites in the US. As such they are very easy to visit if you are in the San Antonio area. 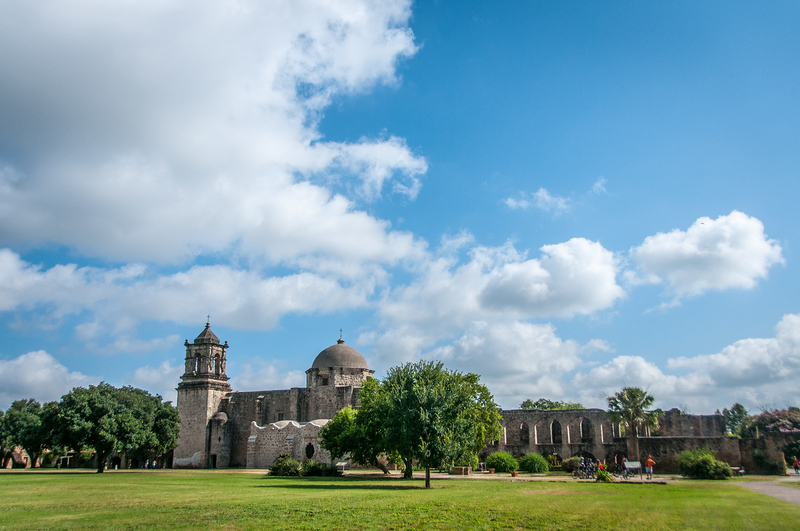 San Antonio Missions is a cultural UNESCO World Heritage Site in the US. It was inscribed into the UNESCO list in 2015 and is also one of the units of the US National Park Services. This historical park was established in 1983 in San Antonio, Texas. The park spans a total land area of 948 acres and is established to preserve 4 out of 5 Spanish frontier missions. These missions were established by the Catholic religious orders that created these outposts in order to spread Christianity. Aside from helping to spread Christianity, the San Antonio Missions are also part of a colonization system in the Spanish Southwest. These colonization efforts were executed from the 17th to the 19th centuries. Misión Nuestra Señora de la Purísima Concepción de Acuña, or known simply as Mission Concepcion, is one of the four San Antonio Missions recognized into the UNESCO World Heritage Site list. This was established in 1716 but was moved to San Antonio in 1731. This mission was founded by Franciscan Friars and is considered as the best preserved out of all the four missions within the park. It was also named a National Historic Landmark in 1970. This mission was established in 1720 and was named San Jose Mission National Historic Site in 1941. To this day, the mission is still standing even though it was constructed in 1768. The San Antonio Missions National Historic Park visitor center is located right next to this mission. This is another mission established in 1716 that was renamed and moved to San Antonio at a later date. This mission was also included into the National Register List in 1972. This is the last of the four San Antonio Missions recognized as part of the UNESCO property. This mission was established in 1960 near the location of what is now the city of Augusta. It was moved to San Antonio in 1731 and was given its current name. This mission is located along Espada Road and is listed as one of the properties on the National Register of Historic Places. All missions continue to be active Catholic parishes. Hence, do keep that in mind when you are visiting the missions. There are regular services held at the historic missions. You can check out the schedule before you go if you want to attend a service. There are designated park hours for the San Antonio Missions. However, it might be closed from visitors during special services such as funerals or weddings. 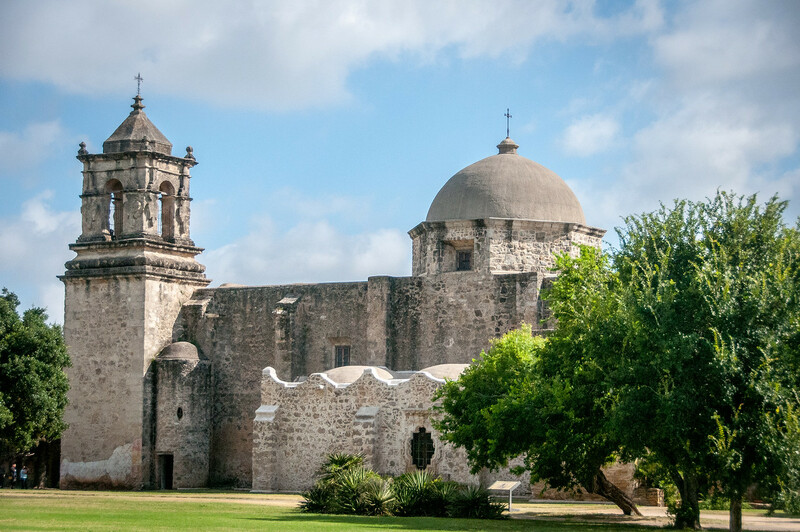 You can choose to visit one or all four San Antonio Missions. There are also several other recreational activities within the historical park. I enjoyed this article. I agree with the recommendation to visit all of the missions. Each mission site has a different history and a unique story to share. The collection of five will change your perspective on the overall region. I tried to choose a favorite, but couldn’t because they are each special in their own way. Looks beautiful and sounds really interesting.